Bob Piekiel’s monthly session at Baltimore Woods featured crystal clear skies, increasingly cold conditions (a recurring theme this year for all of the previous sessions), and one large scope. This Baltimore Woods session was the last scheduled event before our Winter constellations all-but disappear from our nighttime skies. To this pressing deadline was added the last reasonable observation of Comet panSTARRS (C/2011 L4) from the same location, as the return of the foliage through May will all-but obscure the parts of the North/NorthWest horizon that are not already obscured by naked branches. The event itself was scheduled from 7:30 to 9:30 p.m., ending an hour before any first observation of Saturn for the evening. The ever-dropping temperature that evening found us ending the session promptly to the sound of running (with heat on full-blast) cars and depleted propane. Bob Piekiel and the author post-assembly. 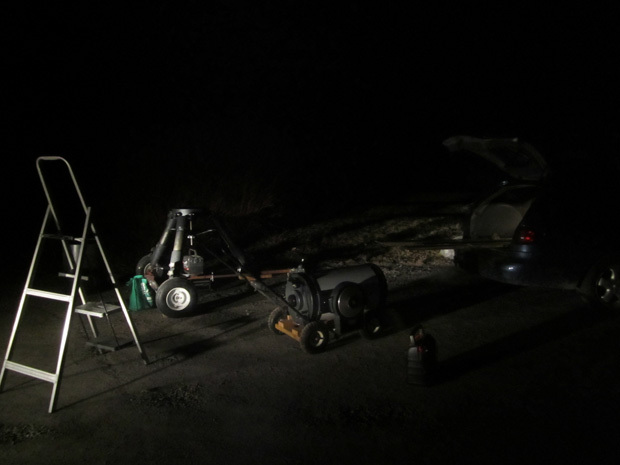 With a confirmed heavy lifter attending (me), Bob opted to bring out a 16” Meade SCT on a homemade tripod that is (minus the scope) transported in the open – the whole considerable contraption hitches to the back of the car. After a bit of heavy lifting and careful coordination to get the scope up to the mount, the completed assembly was ready for the first signs of bright stars (in this case, Sirius and Capella) to perform the alignment. 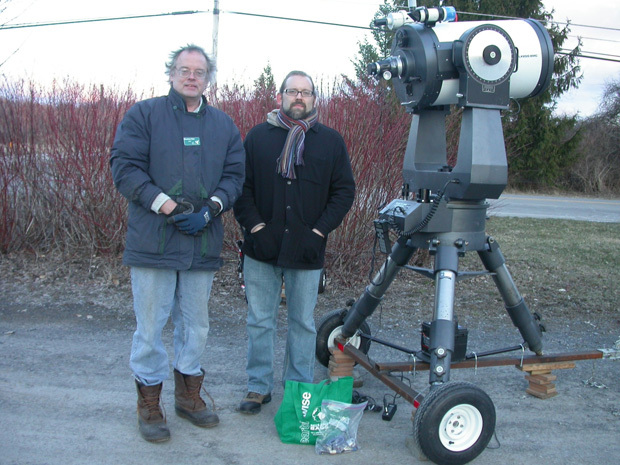 The time waiting for bright star arrivals was passed with the help of a pair of Zhumell 25×100’s that saw (1) clear views of Jupiter and all four of its largest moons and (2) Sirius in Canis Major to the West. 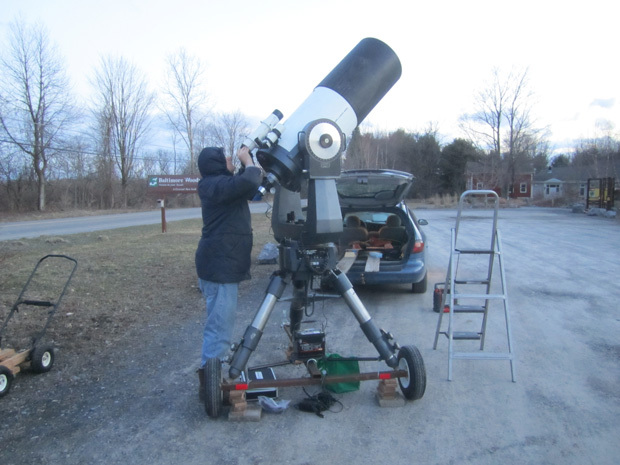 Bob Piekiel putting the finishing touches on a 16″ Meade SCT. The height of the tripod combined with the extra 8” of wheels on the mount’s base meant that a step ladder was required for nearly all viewing throughout the night. With the 16” SCT aligned, the first official view (pre-dark sky) was of Jupiter, which was bright and clear in Bob’s 40 mm Meade eyepiece. The second object was Trapezium in the Orion Nebula (M42), which was also crisp and clear despite our observing it only minutes after sunset. The third object observed combined low brightness with near-horizon position just past dusk. Bob managed to find Comet panSTARRS almost due North of the Andromeda Galaxy just as it was about to hit the bare tree line. The view was excellent for several minutes as everyone had a few looks at this increasingly difficult-to-observe object (comet’s center was reasonably well defined, but this was a 16” scope with a 40 mm eyepiece). And, it should be noted, the object database in Bob’s GOTO computer is not only older than the discovery of Comet pan-STARRS, but also quite a bit older (decade? maybe two?) than the Panoramic Survey Telescope and Rapid Response System (Pan-STARRS) that originally identified the comet. So, extra kudos to Bob for the timely find! The cold set in quickly after these first three objects, meaning the last four objects for the evening were approached with haste. In a return to the objects of his last session, Bob treated attendees to excellent dark views of M65 and M66 in Leo, M108 (a faint edge-on galaxy near the Owl Nebula in Ursa Major that was as bright in the 16” as it was with Bob’s 11” scope + image enhancer), and the Owl Nebula (M97). Bob and I saw this final object as a confirmation that it hadn’t flown the coop during our last session, where the image enhancer failed to produce any particular view of this object (see the last session notes for details). 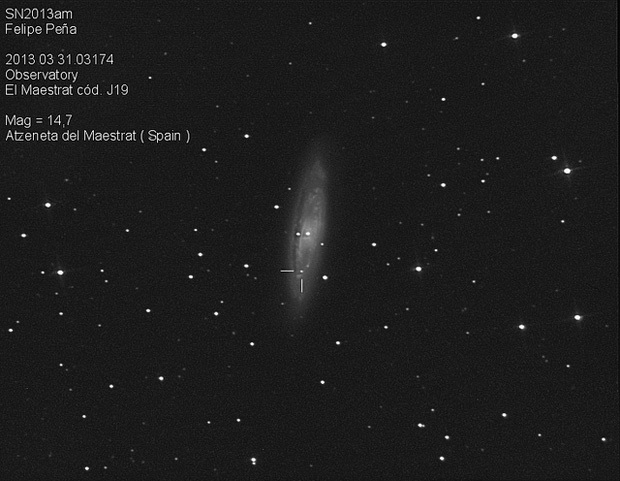 New supernova in M65. Photo by Felipe Pena. The totality of views through the Zhumell 25×100’s were limited to Jupiter (as a sampling for the attendees before the 16″ was properly GOTO’ed), Sirius (just to the left of Orion and the brightest star in our Night Sky), the Double Cluster in Perseus (bright and densely packed), and the Pleiades (M45), the object for which I assume 25×100’s were originally designed to observe (near-perfect fit of the whole cluster in the field of view). A few street lights and distant clouds to the East reflecting Syracuse back down provided all the illumination that the stars didn’t as we began to pack up the gear at 9:30 p.m.
And did the 3rd Quarter Moon affect the viewing? For those observing at “reasonable” hours, it is the case that the 3rd Quarter Moon doesn’t rise until midnight, meaning the week before a Full Moon, the week of a Full Moon, the few days before a 1st Quarter are excellent for getting outside to observe deep sky objects at “reasonable” hours (reasonable being relative, of course). Not a lunar landing scene. Mid-way through the 9:30 pack-up. Next session is scheduled for May 4 (Saturday) – 5 (Sunday), 8-10 p.m. and will feature Jupiter, Saturn, and hopefully a few shooting stars from the Eta Aquariids meteor shower. For details and registration, see the details on this CNYO page.